Home Tips	Dollar Store Halloween Decor-3 easy crafts! Yesterday I popped into our Dollar General Store to take a quick look-see at what they had for fall decor. Like most stores of this nature some items are truly $1 and others are $2 and more. So with my $1 per item budget in mind I picked up several things. Want to see what you can find for one dollar? I must admit I don’t like scary things. Not scary movies, haunted houses, creepy corn mazes and the like. I’m more of a happy Halloween person that likes to decorate with pretty leaves, pumpkins, gourds, corn stalks and cute scarecrows. Therefore many of the skeletons, monsters, bats and snakes available did not make it into my shopping basket. I did buy a few plastic spider rings (because they were not scary) and some black spiders, but only because they were covered in glitter. (thus making them acceptable in my mind) Using my new dollar store purchases, here’s what I came up with! 1-I found sets of glittery faces in shapes of a pumpkin, skeleton and a Frankenstein made from foam. Each pack of 4 was $1. The eyes, noses and mouths pop out so you can use those separately. I decided to make a small trick or treat container using a bucket I had on hand. The bucket is white with a few stickers, which I removed. It held chlorine tablets for the pool, therefore it was already sanitized! I washed and dried it well to remove the chlorine smell. I spray painted the bucket black and glued the orange pumpkin onto one side of the bucket. On the other side I glued the skeleton head (without the faces so the black would shine through.) I added some ribbon to dress it up a bit and it’s a cute bucket to hold candy! 2-The eyes, nose and mouth of the pumpkin and skeleton were too cute to throw away. I thought these would be so cute glued to a sandwich container for a child’s lunch. What a fun surprise! I used a glue stick so it’s easy to remove. 3-The dollar store had sets of four small plastic tumblers for $1. Each had a cute Happy Halloween message on the front. 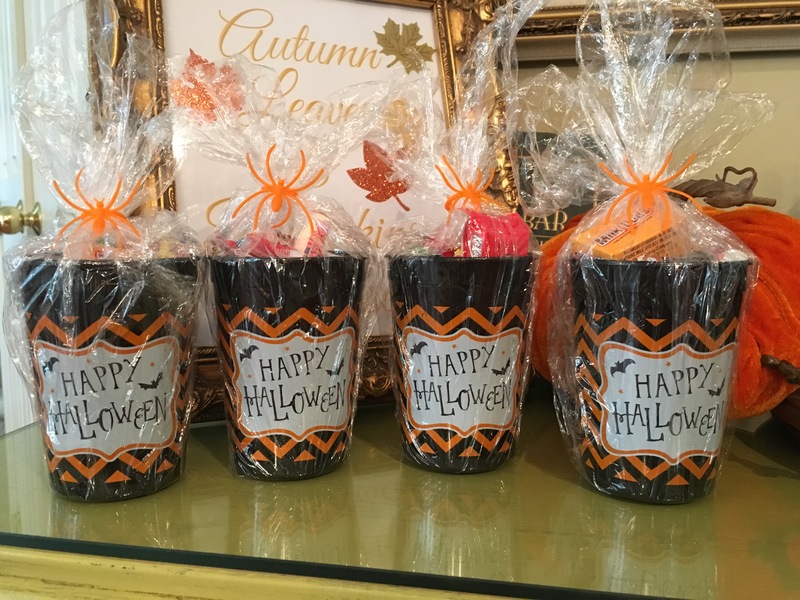 So, I filled each one with individually wrapped candy and then wrapped each tumbler with cellophane. I cinched the top of each one with a plastic spider ring. These would be adorable as classroom gifts or for a party! Very inexpensive and reusable! For less than thirty cents each (plus the cost of the candy) you have a fun little party favor!